I spent most of my childhood and the better part of my 20’s in Hong Kong, the United States, and Britain. My experience of living and studying abroad at an early age has certainly fostered my creativity and helps me to approach things from multiple angles. My interest in technology, science and art initially led me to take up architecture as my profession. While I practice as a designer, I always paint whenever time allows. I always feel that both fields have certain similarities in terms of creative outlets and complement each other well as far as the methods of visual communication are concerned. Suffice it to say that art and architecture share a lot in common in terms of engaging with forms, structures and color. So I could say both pathways merged naturally for me ever since I graduated from the college. I adopt and explore the digital hybrid technique, incorporating various constituent elements of architectural, graphic and mixed media conventions. Furthermore, I employ the juxtaposition of different forms/patterns, intertwined textures/tones, oblique/anamorphic projections and visual metamorphoses to question and investigate the nature of visual representation in the context of non-Euclidean configuration. The application of these strategies allows the work to transcend boundaries between analog and digital as well as between two- and multi-dimensional domains, while the underlying issue of precision, accuracy and the sense of realism, which are often associated with conventional architectural production, are clearly addressed. I always define my artistic and architectural projects as a series of critical reflections and commentaries on our contemporary cultures and their influence on cities in visual, semiotic and narrative terms. My work is inspired by the spatiotemporal conditions of our ever-evolving urban and ecological environments, which are attributed to the multitudes of spatial practices, constructed by consumer societies in various forms. The whole nature of cities can be characterized by dichotomy and paradoxical relationship among organic and inorganic, structural and amorphous as well as micro-scale objects and large structures. These seemingly polar opposite elements could integrate with each other and morph into totally new structures of the spatial and temporal variations in my paintings. Furthermore, the paradox, contradiction and distortion of an alternate perception towards space and time have also been a constant subject of inspiration. How long does it typically take for you to finish a piece? It usually takes a week or two at the longest. Some of my work cycles through phases and takes several months to complete. In such cases, I disassemble/reassemble fragments of old drawings and found images, and then repeat the process over and over again until I find unpredictable dialogues among them. I still work on architectural and urban design projects from time to time as I’ve completed a residential building earlier this year. Those experiences often turn out to be the source of great inspiration and motivation for my art-related projects. By continuing to work in both fields, I manage to strike an ideal balance between art and craft. Most of my work is meant to bridge the gap between architecture and art, two cultural realms, which reflect on the multitudes of contemporary socio-cultural outlooks and to transcend or merge the bounds of them as my own artistic expression. At any rate, my compositional methodologies imbue the drawings with the essential elements of our social and cultural realms beyond the conventional protocols of architectural and artistic formalities. At first glance it might sound like a career detour, however, it is always helpful to go off the beaten path before starting out as an artist. In my case, my experience as an architectural designer and urban planner certainly helped me to break the mold and approach my work with a broad perspective. So I’d like to remind my younger self that we don’t have to hold onto preconceived notions and always stay open-minded. There are no shortcuts to finding your true purpose in life. As often quoted: “Don’t bend. Don’t water it down. Don’t try to make it logical. Don’t edit your own soul according to the trend. Rather, follow your most intense obsessions mercilessly.” That is probably the greatest piece of advice that Kafka gave to his posterity. I am always interested in fusing different media into my artistic expression and taking on an interdisciplinary approach. The work, which started out as a painting, could be transcoded as a blueprint for an interactive multimedia art project incorporating audio, web, video, installation and performance. To begin with, I construct base 2D/3D images digitally and then add layers of traditional medias such as acrylic, ink, and graphite, as well as scanned images of found objects over them. Then they are further processed and manipulated through algorithmic, stochastic and morphological operations by various image processing software with plugins. The technique allows me to instill a warm human touch and painterly, organic feels to otherwise cold and detached precision of digitally generated drawings. 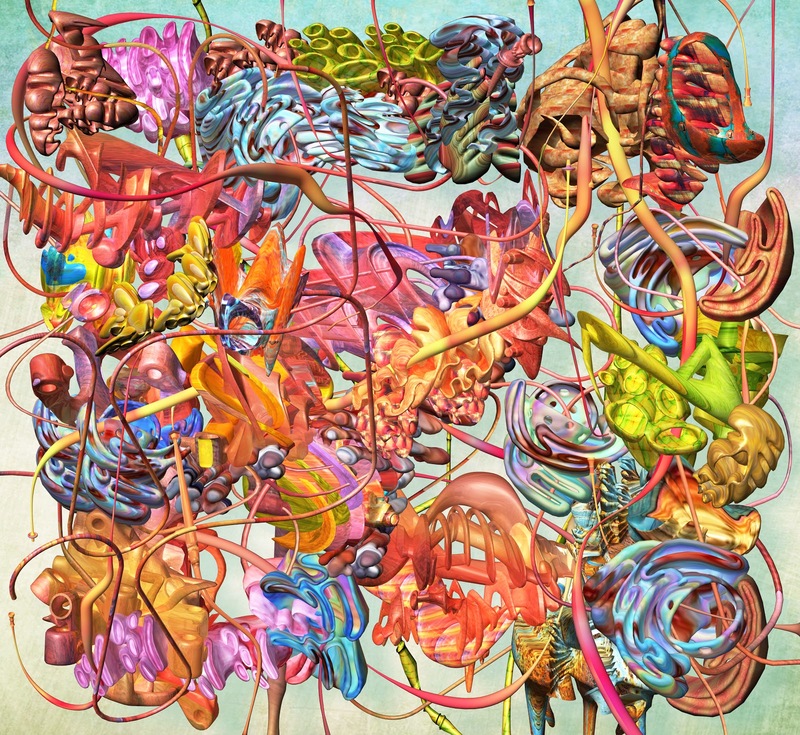 Check out more work from Ryota Matsumoto here.